For this year’s SoXperience, our instructor is Lorilee Beltman, coming to us from Seattle, Washington. We know you will love the classes she has created for you. Additional activities we have for you at this year’s SoXperience are a special Island tour just for you, an early bird class for your choice, and the spring pony round-up. Lorilee has held classes at national events for ten years and teaches on line at Interweave and Craftsy. For Lorilee’s complete bio, click here. Beautiful, Useful and Underused Cuff Cast-Ons for Socks. We aim for stretchy, non-binding tops to our socks but how about beautiful too? And fun? Who ever heard of such a thing. Well, Lorilee has a wealth of cast-ons to entice you. Working many colors at once, using strands that are friendly once Lorilee shows the techniques. Applications of this technique are quite endless. Yikes! Cut your stitches? Learn how to plan, place, shape that heel. And, goodness, would this apply to thumbs in mittens, pockets on sweaters? Let’s find out from Lorilee. That toe doesn’t show, but hey! How about comfort and no places that wear through? 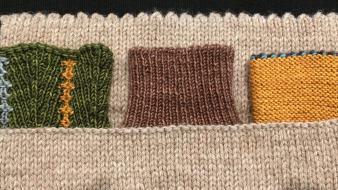 Tricks to various stitches that can add a sense of accomplishment to starting or ending a sock. Complete information and description with materials list of the workshops can be found here. Special activities on the Island. 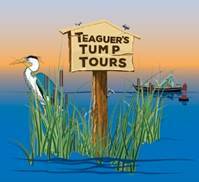 Join us for Teaguer's Tump Tours on Friday, April 13th, 10-12. Local history, legends and lore! Learn about our heritage, our industries long gone and our colorful characters. Tours are led by a multi-generational Teaguer. Ride in the comfort of a passenger van. You will have opportunities to ask plenty of questions. See places you've never been and learn about events that you never knew. And find out what a Tump is! Each spring the ponies are rounded up for vet check and here is your chance to see the ponies close-up. Maybe even some foals will be around by then. Friday is the day/evening to see the southern herd. The Fairfield Inn & Suites , 3913 Main Street, is awaiting SoXperience registrants with lovely rooms and continental breakfast. When making your reservation, please tell them you are with the knitting group. 757-336-0043. Our workshops and meetings will be held on Chincoteague at the Island Theatre Annex located next to the Island Theatre at 4074 Main Street and easy walking distance from the Fairfield Inn. Parking is available if you would prefer to drive. We have use of the Annex from Friday morning through Sunday with a keyed entrance for us. It offers lovely accommodation for our workshops and gatherings. The SoXperience weekend is $150 which includes Friday evening, Saturday and Sunday workshops. The Early Bird workshop and Tump Tour are add-ons which can also be reserved on the registration page. As we have in the past, we plan to offer sandwiches, salads at meal times catered by restaurants on the Island. When you register for SoXperience, we will send you by email, a menu for you to make your choices for the weekend and you will be able to pay for them then. We also plan on eating together Saturday night at a local restaurant.